Sketch F Showing the Progress of the Survey in Section VI. With a General Reconnaissance of the Coast of Florida 1848-57. 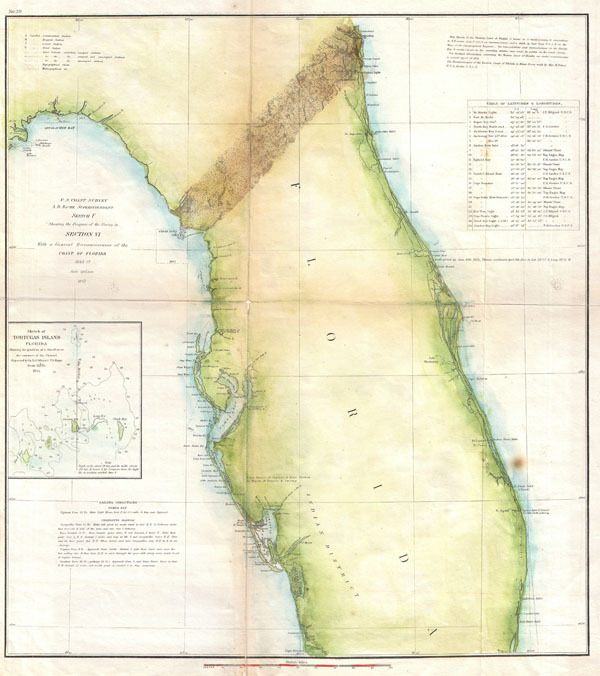 This is a rare 1857 U.S. Coast Survey chart of the Florida coast. Omits the southern top of Florida. An inset in the lower left quadrant details Tortugas Island. There is an interesting swath of inland detail between St. Mary's and the Cedar Keys – indicating a rather early state of the Florida survey. There are several interesting notations on the eastern coast of Florida regarding bottles being dropped and retrieved – presumably an early technique for measuring currents. Sailing instructions for Charlotte Harbor and Tampa Bay in the lower left quadrant. Upper right quadrant features a table of latitudes and longitudes for important points along the coast. This map was produced in 1857 under the direction of A. D. Bache, superintendent of the United States Coast Survey. Very good condition. Original folds. Minor verso reapirs along original fold lines - especially at fold intersections.